I'd like to see the spread of horrendous events that you've experienced when flying with your horn(s). Here's one from me, that happened this summer. This past spring, I was offered to travel to an Italian summer festival with a local youth orchestra during late July. I had contacted them, seeing if it was possible for them to rent a tuba while I was there (they were renting cellos and basses). Unfortunately, no one was willing to rent a tuba for almost two weeks. So, I flew with my Mack 186 clone (my previous instrument before the Ursus). I borrowed an absolute tank of a flight case, and packed my tuba up in it, along with a practice mute in the bell, 325 sq ft of bubble wrap, and other odds and ends from my carry-on suitcase that wouldn't fit in it. I brought it in to DCA to check it (the orchestra generously offered to cover oversize and overweight fees. I had checked the Delta website for its policy on musical instruments, and I thought, "Okay, I think I'll be fine, it fits all the specifications." I arrive at DCA four and a half hours before my flight leaves, because I can just tell something will happen. The attendant said, "I'm sorry, but we can't take this on the plane." "How come? It fits all the requirements for Delta's musical instrument policy." Unfortunately, EU regulations don't let you take anything over 70 lbs, period, unless you ship it as cargo. If I shipped it as cargo, it would arrive a couple of days after our first concert, which wasn't going to happen. The case, by itself, weighed 74 lbs. Naturally, I panicked. After some discussion with my teacher and my folks, my folks drove home, grabbed my gig bag (Wessex), and I unwrapped, rewrapped, and repacked my horn into a Wessex bag. Luckily, the Wessex bag is a bit on the roomier side for my horn, so I was able to fit everything I needed. Total weight: approximately 47 lbs. I then begged the flight attendant to let me gate-check my horn and to be present for inspection, which fortunately occured. Surprisingly, the horn didn’t sustain any major damage. The most noticeable one was a large crease on the bell that was easily repaired. Diego A. Stine wrote: I then begged the flight attendant to let me gate-check my horn and to be present for inspection, which fortunately occured. That's what I did. The items at the gate were a couple of the usual strollers etc., and my big (but not really very strong) SKB case. They went out to the big, wheeled mobile staircase that serves as access from the "gate" to the ground level pavement. If you look out the window while you're waiting to board, you might see one of those things. See if they don't have a chute on one side. According to my theory about this, what saved your tuba may have been that you put it in a vulnerable looking case. I would have done better to put my bari in its '50s factory case, where it would have really looked like a musical instrument. Somewhere here there's an anecdotal case of someone who checked a tuba wrapped in some bubble wrap and it traveled to China with him, no problem. The baggage people have this reputation for deliberately destroying instruments, but I think usual it's just a reality of trying to get a lot of baggage from point A to point B, you treat things with at most what care it looks like they need. A real flight case, meaning ATA Approved for flights, has no room for extra stuff. It is filled completely with padding. 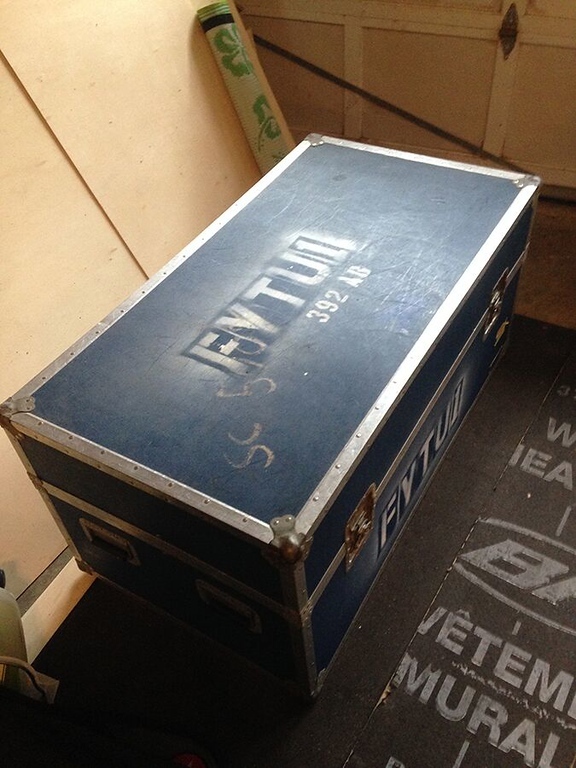 The exterior is not what makes it a flight case, nor the hardware, though that is a part of it. It is how well the instrument is isolated from shock. If there is empty space in the case around the tuba it can and will be damaged. … does not mean it is an ATA Approved case. The inside is what matters. No matter what a maker or seller tells you, if it does not meet the ATA standards it is not a real case made for air transport. You can see how different this is from what most people call a flight case. With that in mind, I used an identical case, made for my specific model of tuba, and flew to Spain. In Spain and the Mediterranean I took four flights and six busses over about two and a half weeks of touring. At no point was my horn mistreated or damaged — UNTIL (yeah, you knew that was coming, heh, heh…) we made it back to D/FW International, where the baggage gorilla slung the case onto the conveyor from the 747 down to the tarmac. A few yards out of the 747's cargo door the case slid sideways on the conveyor belt and fell about 15 feet down to the tarmac. I watched this happen. I was LIVID! But because I had wisely chosen to rent a real ATA case for the trip the only damage was that a half inch deep crease about three inches long was in the edge of the bell. That was it, after a free-fall of 15 feet onto cement. THAT is what a flight case is made for: not stacking or lots of vibration, but falling from the aircraft or other damage inherent to air travel. The damage cost me about $50 to fix and the airline paid that for me. They did not argue with me about it at all because everyone could see this happen as we were all at the window watching our instruments being unloaded, and because I used an ATA approved case, which the airlines recognize and will work with you if damage occurs. If it is not an ATA case they can and will deny responsibility because you used an inferior case not designed to meet ATA standards for air transport. Not my case, by the way. 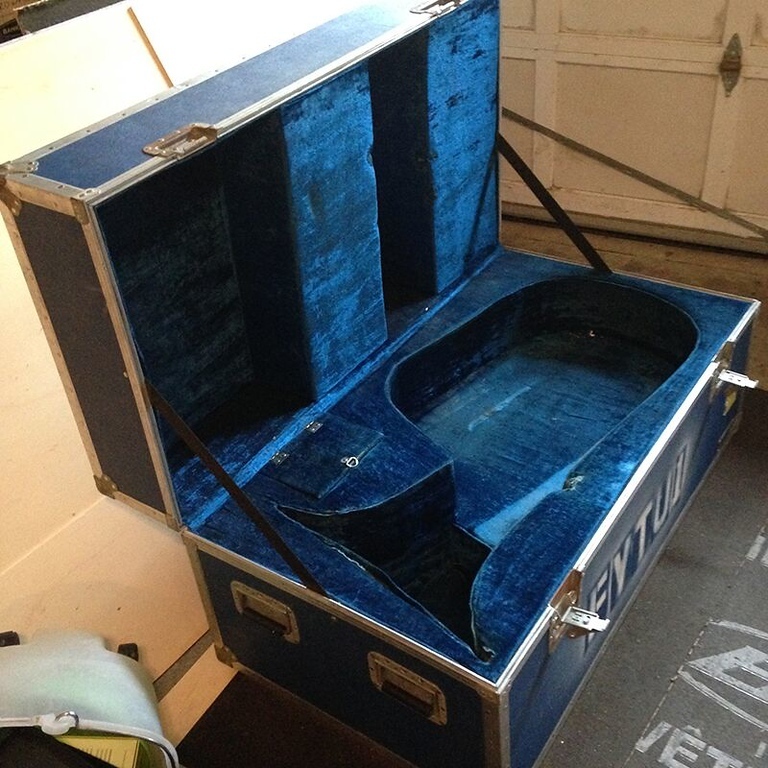 I snagged those off the Internet years ago because there are so few photos of a real ATA flight case for tuba available online. The one I used was made by Anvil Cases. Anvil is now owned by Calzone, which makes "improved" Anvil cases under the Calzone name, but still sells original Anvil designs for a higher price. Whatever. You buy one of those and it becomes your coffee table. Massive. I may get one for my orchestra job. We do a lot of bus travel in the Spring every year, and my wood shell hard cases and my plastic MTS cases all have suffered damage over the years. I have the right to store the case at the office permanently, so I may do that. I don't want one of those in my house, and that is the main reason I no longer own one. Well, that and I also keep changing horns, and these have to be custom made to fit exactly. If I ever settle on something to use at outdoor Pops programs I will probably get an Anvil Case for it. Maybe my 186? There must be a used 186 case out there for a price lower than an acre of bottom land by the river… HA! The last time I toured Europe with a tuba (for three weeks with a jazz band), the only thing I owned was my F tuba (which I still own) and a leaky (but in a good way ) Eb sousaphone. The sousaphone was more unwieldy, so I took the tuba (in a plain-ol' USA-made-at-that-time GWW not-protective wood case). Some will label me an old grump ("walked eight miles in the snow barefoot" / "back in the old days" etc. ), but - "back then" (here you go, bloke... ) - there were still porters outside the front doors of airports (whom you TIPPED), and who would look after you...even hand-delivering well-tipped luggage all the way to the plane...and even MARKING the luggage to be ported BACK OFF the plane at the destination. Today, I would NOT fly with ANY tuba other than some viewed-by-me-as-disposable tuba due to (again) "things just not being as they were then". For the same sorts of reasons, we (Mrs. bloke and I - Mid-South Music, Inc.) stopped renting band instruments out to people about fifteen years ago. Primarily, mishandled-while-in-the-case (shipping/traveling) tubas suffer bell flare damage and (if rotary) carriage damage. The best strategy (if deciding to risk putting a tuba underneath an airliner) is to acquire a TOUGH-frame case (NOT attempting to beat weight surcharge fees) where (rather than padding) there is significant space (i.e. nothing) between the bell rim and the end of the case, as well as significant space between the rotor paddles assembly and the case. Obviously, such a case requires some cleverly designed methods of keeping the instrument's bell rim and carriage assembly away from the case exterior. Padding (after traveling quite a few feet - and picking up considerable velocity) can (just as with hitting water when falling into it from considerable distances) become quite "hard"...i.e. "hard - like wood or metal". Again...I have sworn off "flying tubas" (unless "flying CRAPPY tubas" or "flying SOMEONE'S ELSE who accepts the risk tubas"), but I still (well... ) keep one each of two sizes (should fit about anything) of those no-longer-made thick (real) fiberglass cases. I haven't used them in quite a while, but I'm not looking towards selling them. I sold a similar pair years ago, and ended up having to find two more (luckily: at "popular prices"). Over the summer, I bought a tuba that was located in Venezuela. Shipping from there proved to be extremely difficult, and after several weeks and many different tries with other shipping methods, commercial airline flight was the only method left to consider. The seller built a large wooden crate for the tuba, and packed it tightly in that crate. Unfortunately, his crate was turned away at the airport... not because of size, but because the crate was wooden and the lumber that was used couldn't be brought into the US. At that point, the only option was to pack the tuba as well as possible inside the gig bag, stick that under the plane, and hope for the best. Once the tuba arrived in the US, the tuba made the rest of its journey from Florida to Minnesota via Greyhound bus, in the gig bag. To be honest, with the turmoil in Venezuela (this was right after the assassination attempt), I had feared that this might be the the last shot to get the tuba from there to here. It seemed that things could totally collapse, borders locked down, travel to the US restricted, etc. So it was time to grit my teeth, shove that sucker under a plane/bus, and just get it to Minnesota. I figured I could just pick up the pieces when all was said and done. The seller and I both know and realized that this was an exceptional situation, which was well outside the boundaries of "normal" and what we would ever consider doing otherwise. Basically, a last resort situation, but actually for real (people kind of toss around "last resort" as a term, but there was no other option here). In the end, there was some damage, but not destruction. 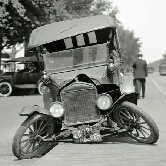 Everything is fixable. To be honest, I've experienced worse damage within the US from UPS and a domestic airline flight with a sousaphone in a wooden case. Neither of those tubas was well packaged (and not my fault). Tuba is still in the shop, but about 1 week from being completed. I flew to Spain and France last summer for a gig - the horn I took is a 712-ish 5 valve BBb Franken-York of my own construction. I put the horn in a correct-fitting Cronkhite gig bag, and then in a Walt Johnson 6/4 travel case. The fit was snug, but secure (NO movement of any kind inside - as Wade correctly stated, it's not only the quality of the case construction, but the fit of the horn inside of the case that is just as critical). I arrived at the airport several hours before my flight time, so that I could make it absolutely certain that I would be present during TSA screening - IMHO, this is where trouble can really happen.....if the horn isn't put back properly, NO amount of protective measures will work. The gentleman screening was very accommodating, and while I was not able to touch anything during the process, he asked me numerous questions, such as how to handle and repack it, etc. Generally speaking, the screening usually will take place in a location where oversize baggage is accepted, so you will likely have one-on-one interaction in a less-hectic area. 15 years ago I flew across country with my tuba in an Anvil case, just like the one Wade posted pictures of. The problem was getting that case to the airport in the first place. I had no access to ground transportation large enough for the tuba case, so a relative of mine in the area volunteered to ask their next door neighbors if they could give me a ride to the airport since they had large vehicles that would be able to accept the tuba case without any problem. We coordinated the ride and on the day I was to travel I dragged the Anvil case out to the curb and waited for my ride to show up. A few minutes later a funeral hearse drives up, rolls down the window and says "you're headed to the airport, right?" Joke was on me, for sure. My relative lives across the street from the funeral home and those were the folks with the large vehicles she was talking about. No matter, we loaded the Anvil case in the back of the hearse just as if it were a casket and off we went. If you can get past the fact that it's a funeral car, a Cadillac hearse might just be the ultimate tuba mobile. I haven't flown with a tuba since then and have no plans to ever do so again. I have only a non-transport story. Back when I had my MW 183 F, I wanted to take it to Seattle (from AZ) to visit with my pianist brother because of musical things we had scheduled to do. Like the Brahms horn trio. I bought a flight case from a well known custom builder; the tiny tuba was still too large for the size small so they sent me the size medium. Problem was, the only thing held secure in the case was the bell rim. The tuba could flop around like a pendulum in there. I was expecting a fitted case because of the measurements I sent and was unwilling to assume I could properly pack it in there (and the edge of the bell rim was VERY close to the end of the case, while the sturdy bow end had LOTS of padding.....so I ate a LOT of $$ and sent the case back. I am VERY glad I don't have to travel with a tuba, given my experience with what was supposed to be the best. If I did have to travel with one, I'd have a junker that was playable. Mine is pretty mild. I played a few gigs with the 484th from Milwaukee in early July some years ago and was going to play with them for AT a few weeks later in Alaska. After the 4th, I packed "my" horn with their EQ to go up on a truck. That went great; the 1281 F was a great fit for strolling jazz and concert band and the commander wrangled me a sousaphone from the Wainwright band for a ceremony. I did end up somewhat unexpectedly having to fly it back to Chicago so I stuffed the case full with clothes and checked it on. I ended up with a very mild bell crease (stock Miraphone plastic case, I had not intended to fly with it), a note saying the case had been opened and inspected, a somewhat funny photo with a huge, toy like stuffed orca in Washington state, I believe, as I grabbed a beer at 7am on my layover home, and a hugely awkward trip home from the airport with a tuba, 2 duffle bags, 2 backpacks, and a carry on. Alaska rocks. I know 2 people who went to Russia. One horn was a Yamaha YBB641 and the other was a Miraphone 186, both with the factory case.The trip over everything was fine and the concert series went off without a hitch. The trip back one horn was totaled and one was severely damaged. Fortunately the band covered the cost of both. (about $10,000 for both). On another note, I donated a horn to a local underprivileged middle school and within 6 months it had been run over by a truck... SMH. No real horror stories to tell... Check-in officers have asked for extra fees due to the weight of my sousaphone (~25kg, or 55lbs), sometimes negotiable, sometimes not. Drummers often face the same problem. I've got directed to a special inspection line as it hasn't fit through the standard baggage line. Some packaging straps have got lost in the inspection process. That's pretty much all. While waiting for boarding to begin, I've seen baritones and French horns being roughed by the baggage loaders. Remember to pack your instruments properly. The heavier it is, the more rage is involved. Do not lock the case because it may be inspected manually as well. They will open it with force if needed.